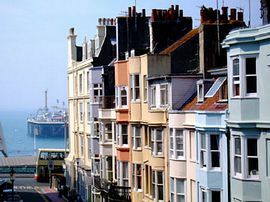 We rent out one double and two single rooms in our private house in Kemptown, slap in the middle of Brighton's gay quarter, right opposite the Marine Tavern and only about 250 yards from the beach. We do not provide breakfast. The Palace Pier with all its diversions is just around the corner, as are the Water World aquarium, the Royal Pavilion palace, the famous Lanes, the grungier or, better, Bohemian Lanes and the main shopping streets. Brighton, and especially the Kemptown area, is renowned for its eateries, so we do not provide any meals. Most people don't want to feel they have to get up for breakfast "just because it's paid for". The White Horse tavern in Camelford Street (two streets round the corner) does a full English breakfast for £2.50. For the other meals, there is an unusually interesting variety of restaurants and take-aways all around us, from cheap to expensive, offering everything from junk food to pub grub, from wholesome homely to exotic fare. This is Brighton after all. Sin City, maybe, but Fun City for sure. Free very fast Internet connection. In the middle of Brighton�s gay scene near the beach. From the main railway station, take a taxi it costs about five pounds. From the bus terminus at Poole Valley opposite the pier, walk if your luggage will allow: along the Marine Parade, turn left into Broad Street (4th street on your left). This is NOT yet Terrace Row, so continue till you see the Marine Tavern. We are directly opposite. 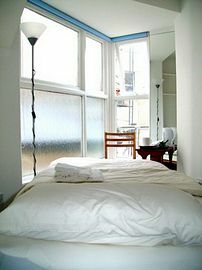 Cosy Room: - single - first floor: £27 per night, Sunday to Thursday. 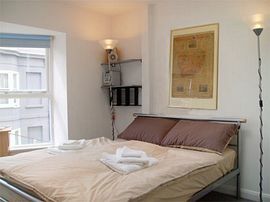 During Gay Pride (25th July to 2nd August 2009) and on Bank Holiday weekends: £45.00 per night. For bookings of longer than 3 nights, the rate is reduced by £5.00 per night from and including the 4th night. 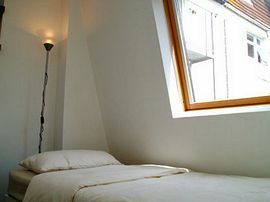 Snug Room: - single - 2nd floor - Sunday to Thursday: £35.00 per night. For bookings of longer than 3 nights, the rate is reduced by £ 5 per night from and including the 4th night. 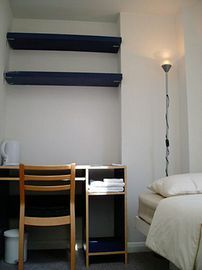 Seaview Room: - double - 2nd floor - Sunday to Thursday: £60.00 per room per night(or £30.00 per person, if you share a double bed with someone - separate duvets, of course. Please arrive after 1 p.m. Check-out is before 12 noon. When you come home at night is your concern.